A stunning mix of miniature bells in shades of pink, purple and rose. The plants have attractive blue green foliage and flowers come out in June to August, all through the summer. 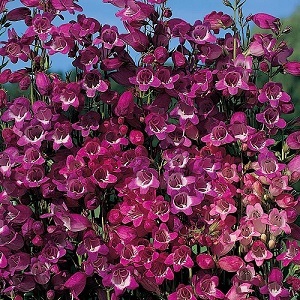 These are dwarf Penstemon plants, growing to a height of about 40cm, and good for smaller borders and containers. Penstemon mexicali prefers sun or part-shade and fertile well drained soil. 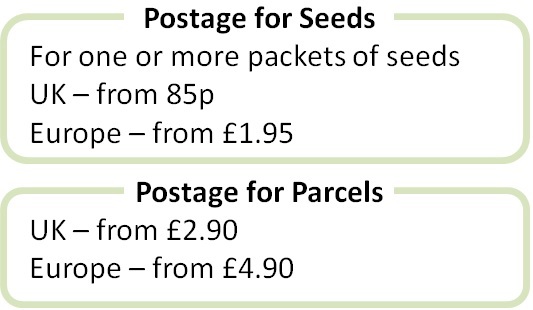 Pack of 80 small seeds. Sow in spring (February to April) for first year flowering and anytime for next year flowering. Sowing instructions and a colour photo are printed on the packet. Sow in spring to autumn. Sow in moist and well drained seed compost. Cover seeds lightly and do not exclude light. Germination takes 3-4 weeks at 15-20°C, sometimes longer. Transplant seedlings into pots when they are big enough to handle and out into the garden after the last frost. Sow by April for first year flowers. Deadhead plants to encourage more flowers. Trim back plants in autumn and cut back old stems to the base in spring when there are signs of new growth. Flowers appear on new growth. Mature plants can be divided in spring and softwood cuttings can be taken in spring/early summer and semi-ripe cuttings in summer.